Labeled movements, the three tapes were shown on small television sets—back then still cathode ray tubes, and so directly referring to the television consumption dominant in everyday life. All three parts begin with the opening title Trio Sonata in Video (I–III): written directly on the “tube” with a dark felt pen, the title was filmed and reshown directly on the screen, creating a tunnel-like “picture-in-picture” feedback effect. The first movement (“Germans and their leisure time”) begins with scenes from a party marquee in which a swaying, loudly singing crowd is celebrating winning the World Cup in 1974. Close-ups of individual figures switch to wider views of the enthusiastic crowd; the camera seems to be taking part directly, without any focus. Shots of youths on bicycles follow, and then people mowing lawns, pruning hedges, shoveling coal, etc., until the camera “goes” to a bar (literally goes, the shot is from entering the premises) and there, similar to the opening, single figures at the regulars’ table and dancing are filmed alternatively with a view of the whole room. Then come young men head banging, a woman moving as if in a trance to electronic sounds, and diverse shots from discos. The tape ends with a small band recording a popular song (“Monia”) in a studio; the song continues as the camera shot roves through the streets of a small town with a coal mine and power station in the background. The second movement (“Germans and their programs”) begins with a quartered split screen that represents the television reality of West Germany in the early 1970s—two stations, the ARD and the ZDF (first and second public broadcasters), show a mixture of entertainment (sports: boxing, crime: mugging), traffic reports, and news, while popular hits like “Ein bisschen Spaß muss sein” (“We all need a bit of fun”) are to be heard. In the following sequence, a policeman with a walkie-talkie is shown in an underpass, shooing away cyclists, holding back curious passersby, and directing traffic. Other sequences show a police band in a city center, demonstrators in front of a university building, and an agitated man who is refusing to accept the detour police are telling him to take. It all ends again with the split-screen sequence in which now cartoon segments, clownery, advertising, and one of the “Mainzelmännchen” (the ZDF mascots) form the conclusion to the song “Jetzt ist Feierabend” (“Well, that’s it for the day”). Since the beginning of the century, the wool’s being pulled over our eyes, in images and sound. […] Something similar happened after the invention of writing. For hundreds, for thousands of years, rulers and their scribe slaves exploited the superior medium of preserved language to control majorities. […] We don’t have to wait centuries to be allowed to do for ourselves what film and television are showing us today. Each and every one of us can start now. We show here how people talk with people through video, how they can reach a better understanding through the new medium. Feldforschung, exh. cat., Kölnischer Kunstverein 1975, 73. Gregor Jansen emphasizes in Deutschland auf allen Kanälen. Das Fernsehen neben dem Fernsehen that the still unusual presentation form of a multichannel installation created a situation enabling those watching to “put together their own film in their minds.” In Record again! 40 Jahre Videokunst.de Teil 2, ZKM Karlsruhe, 292–293, here: 293. The east tangent in Darmstadt was a large city-planning project typical of the time; it aimed to channel the streams of commuters and relieve some of the pressure on other roads in the city center. The resistance captured on video by telewissen can be seen as evidence of the debates which in some cases (for example Bremen) succeeded in preventing further waves of demolition for the building of elevated roads. 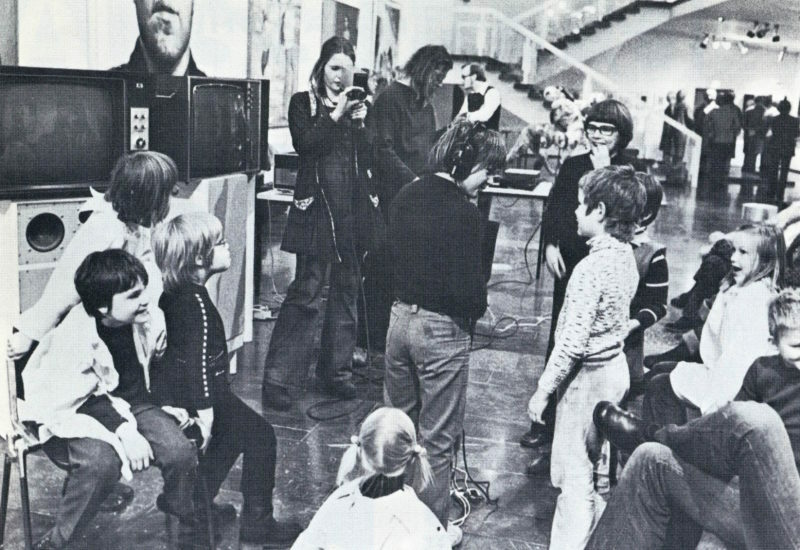 In Wo Fernsehen aufhört, fängt Video an (telewissen, Herbert Schuhmacher, Darmstadt 1976), pictures of the first video experiments in Darmstadt from December 1970 and February 1971 are documented (9–12). In recent publications, however, it is claimed that Herbert Schuhmacher founded the group telewissen in 1969 (see for example http://www.medienkunstnetz.de/kuenstler/telewissen/biografie/). Klaus Dumuscheit and Rolf Schnieders are also named as members in the catalogue Record again! 40 Jahre Videokunst.de Teil 2, ZKM Karlsruhe 2010, 293. “Neue Galerie der Stadt Aachen. Video-Woche: Eigenproduktionen,” in: aachener studentenzeitung asz, no. 15, November 15, 1972, 5. 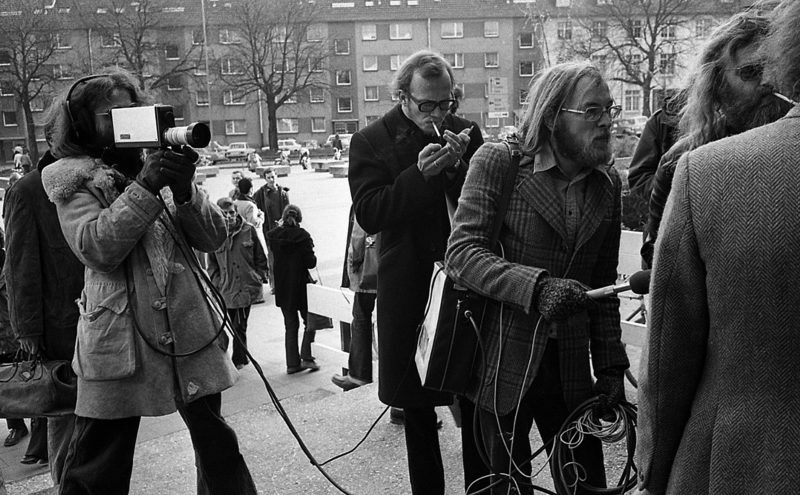 (http://www.mao-projekt.de/BRD/NRW/KOE/Aachen_VDS_Aachener_Studentenzeitung/Aachen_VDS_Aachener_Studentenzeitung_1972_15.shtml, accessed March 3, 2017) and 10 Jahre Neue Galerie – Sammlung Ludwig, ed. Neue Galerie – Sammlung Ludwig in cooperation with Verein der Freunde der Neuen Galerie, Aachen 1980, n.p.